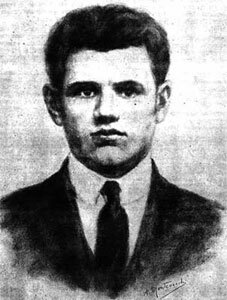 A short biography of Angelo Pellegrino Sbardellotto, Italian anarchist and coal miner who attempted to assassinate fascist leader Benito Mussolini but was arrested and executed. Mel is a pleasant and antique town immersed in the green of Val Belluna, in Italy, with historical sites such as a paleovenetian necropolis, the fascinating castle of Zemelle which, according to legend was built by the Goths, and the beautiful Renaissance palace used by the council. But these places also saw the birth and youth of a man, a historical figure who has long been forgotten; Angelo Pellegrino Sbardellotto, the anarchist shot in 1932 for having attempted to kill 'il Duce' of fascism - Benito Mussolini. His story is tragic like that of other anarchists who tried to kill Mussolini, such as Michael Schirru, also put to death by firing squad, Gino Lucetti, buried alive in the Bourbon penitentiary of Santo Stefano - known as Devil's Island - and the very young Anteo Zamboni, murdered in the street in Bologna, victim of a plot which never fully came to light. Angelo Sbardellotto was born on the 1st August 1907, the fifth of eleven children, into a numerous, and therefore poor family originally from the village of Villa; to survive most of the villagers were forced to emigrate. Angelo and his father also emigrated in October 1924; they lived in France, Luxembourg and lastly Belgium, where Angelo worked as a miner and a machine hand. Still very young, according to his brother, he sympathised with socialism and was shocked by the cowardly killing in the town by fascists of the socialist Edoardo Mattia on the 1st May 1922. Despite a Catholic upbringing and the respect towards authority taught by his family, the young Sbardellotto very soon moved towards anarchism through knowing other political immigrant workers and also through reading anarchist books and newspapers. In 1928 his mother, with the help of the schoolmaster of the town, had a letter written appealing for him to return home. He replied with his reasons why not, expressing his anti-fascism and anarchism and his anti-militarist objections to being conscripted. His mother was a devout Catholic and traditionalist and sought the advice of the local priest. It was either him or the schoolmaster who read the letter out for her, who denounced Angelo to the fascist authorities. He was added to the list of the 270 "most dangerous" Italian anti-fascists living in Belgium. In 1929 while working as a coal miner he joined the anarchist committee of Liege, and was active in the activities to bring about the general strike in Belgium in solidarity with framed Italian-American anarchists Sacco and Vanzetti, alongside Maria Zazzi. He subscribed to anarchist newspapers of various tendencies, such as Il Risveglio (The Awakening), Germinal, Aurora, L'Adunata dei Refrattari, Il Monito and La Lotta Umana (The Human Fight). He was declared a 'draft dodger' and was put on the wanted list by the police (initially as a Communist) and put under surveillance by the Italian secret police from 1929 as a subversive activist. He was stopped and arrested, perhaps by chance, in Piazza Venezia, Rome on the 4th June 1932. He was found to be armed and in possession of a Swiss passport. He was also carrying two rudimentary bombs and a pistol, and was then brutally interrogated and probably tortured at police headquarters, after freely admitting to having entered Italy clandestinely, determined to avenge Michael Schirru by killing Mussolini, and eluding for the third time police vigilance and OVRA secret service agents. He had been waiting for the right moment in the preceding months, but, also so as not to involve any innocent people in his attempt, he had had to give up. His purpose was clearly stated in a letter written by him, dated 27th April 1932: "I have no choice. To be free tyranny must be beaten. To build tomorrow a new order in which all can enjoy the fruits of their labour and freely express their thoughts, we must destroy today all the injustices which render this impossible." Immediately there was a press smear campaign, a necessary precursor for his being condemned to death, during which he was described as 'criminal', 'hired assassin', 'wicked killer', 'a man who has become a stranger in his own country'. A rapid trial of two days took place on 11-13th June. During the farcical court proceedings the journalists referred to his 'surly and sinister look' and in describing him further they also falsely stated that he had a low forehead. At the same time his act was compared with anti-fascism in France, trying to link him to conspiracies and international plots. The hearing before the Special Tribunal proved to be a macabre formality: it began at 9a.m. on the 16th June 1932 and was concluded with the expected verdict of the death penalty only two hours later: the intention was in itself a crime. He refused to plead for commutation, stating that he was only sorry that he had not carried out the attempt on Mussolini, after his lawyer begged him to write to Il Duce for mercy. Therefore on the dawn of June 17th at 5.45 am he was put in front of the firing squad at the Bretta Fort after having refused the priest. His last words were "Long live anarchy!" and he was shot in the back, by a platoon of the Militia at Forte Bravetta in Rome, which during the Resistance in World War II would be the scene of other executions of anarchists and partisans. A few moments before the Republican Domenico Bovone had been executed – he too condemned to death for attempts against the regime. Years later, in 1938, the biographer of il Duce, Yvon De Begnac wrote that Mussolini wanted to pardon Schirru and Sbardellotto for their courage – but not Bovone who was considered a terrorist who only intended to create havoc – on condition that they asked for mercy. If this were true, Sbardellotto had rejected such an option anyway. The anger of the regime and its leader was demonstrated by their decision to keep hidden forever, after the execution, the place where Sbardellotto's body was buried. There were many spontaneous expressions of human and political solidarity that the fascist political police had to register in the area in support of the anarchist from Mel and his actions. In one example, a Paduan labourer was even denounced for having predicted in a hostelry, "We will erect a monument to Sbardellotto." (from France) in 1938 Mussolini, interviewed about political trials -in general, but here in the context of a new batch of them in Moscow- suddenly made as if in fascist Italy justice was... independent, and even recalled a quite forgotten story : he declared that in the case of Schirru and Sbardellotto he would have shown leniency ! This, was nothing but a shameless lie, which is just here to remind that Mussolini had not even the courage of his acts : it is a well-known fact that at the eve of any political trial the president of the Special Tribunal was paying a visit to Mussolini -to learn the verdict which had been decided by the latter. It is not a surprise that the fascist journalist De Begnac later kindly reported this Mussolini's lie in his book "Palazzo Venezia" ; but I hardly understand its presence, on this site.